Tower products work! 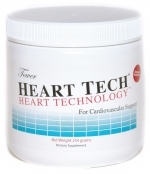 Find out for yourself why Tower's flagship product Heart Technology (HeartTech) at the proper therapeutic dosages has a well-documented 12-year track record of remarkable success. One jar of the HeartTech Lp(a) Binding Inhibitor provides a one-month preventive (two scoops daily) or two-week therapeutic (four scoops daily) supply of Tower's complete Pauling therapy drink mix. Note: To receive the Linus Pauling-recommended therapeutic nutriceutical levels for established cardiovascular disease select 2-3 jars monthly for at least 9-12 months. Price: $39.55 - NOTE: Product autoship schedule can be changed (e.g. to every other month, quarterly, "X" number of jars every "X" number of days, etc.) by calling 702-876-5805 or by email at orders@towerlaboratories.com. The original Pauling therapy drink mix. Save by purchasing 6 jars (half case) at wholesale. A single jar contains a one-month preventive (or 2 week therapeutic) supply of Tower's famous vitamin C, lysine and proline PLUS drink mix. Wholesale price per jar for 6 jars - $38.14. The original Pauling therapy drink mix. Save by purchasing 12 jars (whole case) at wholesale. A single jar contains a one-month preventive (or 2 week therapeutic) supply of Tower's famous vitamin C, lysine and proline PLUS drink mix. Wholesale price per jar for 12 jars - $35.31. Combination Special - HeartTech® and The Pauling Therapy Handbook. Retails for $86.45. Now buy both together for $69.50, a savings of $16.95! Do something good for your heart this year! Hurry while supplies last.